Expedition 53 Commander Randy Bresnik of NASA and Flight Engineers Paolo Nespoli of ESA (European Space Agency) and Sergey Ryazanskiy of Roscosmos landed at 3:37 a.m. EST (2:37 p.m. Kazakhstan time) southeast of the remote town of Dzhezkazgan in Kazakhstan. Highlights from the research conducted while they were aboard include investigations of microgravity’s effect on the antibiotic resistance of E. coli, a bacterial pathogen responsible for urinary tract infection in humans and animals; growing larger versions of an important protein implicated in Parkinson’s disease; and delivering a new instrument to address fundamental science questions on the origins and history of cosmic rays. 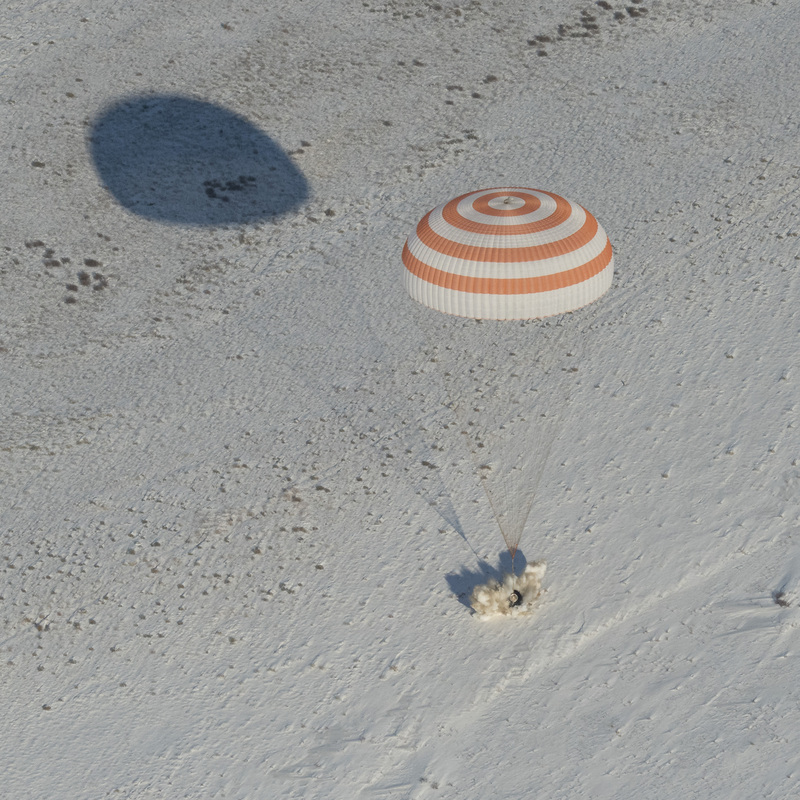 The trio also welcomed three cargo spacecraft delivering several tons of supplies and research experiments. Orbital ATK’s Cygnus spacecraft arrived at station in November as the company’s eighth commercial resupply mission. One Russian ISS Progress cargo craft docked to the station in October. And a SpaceX Dragon completed its commercial resupply mission to station in August, the company’s twelfth resupply mission. During his time on the orbital complex, Bresnik ventured outside the confines of the space station for three spacewalks. Along with NASA astronauts Mark Vande Hei and Joe Acaba, Bresnik lead a trio of spacewalks to replace one of two latching end effectors on the station’s robotic arm, Canadarm2. They also spent time lubricating the newly replaced Canadarm2 end effector and replacing cameras on the left side of the station’s truss and the right side of the station’s U.S. Destiny laboratory. Ryazanskiy conducted one spacewalk with fellow cosmonaut Fyodor Yurchikhin in August to deploy several nanosatellites, collect research samples, and perform structural maintenance. The Expedition 54 crew continues operating the station, with Alexander Misurkin of Roscosmos in command. Along with crewmates Mark Vende Hei and Joe Acaba of NASA, the three-person crew will operate the station until the arrival of three new crew members on Tuesday, Dec. 19.Scott Tingle of NASA, Anton Shkaplerov of Roscosmos and Norishige Kanai of the Japan Aerospace Exploration Agency (JAXA), are scheduled to launch Sunday, Dec. 17 from Baikonur, Kazakhstan. NASA Television will broadcast the launch and docking. We are thankful that you are safely back on Earth, and grateful for your ongoing example of leadership excellence in the name of military and international relations, space exploration and science, and our core values of honor, duty, respect.